On Monday Channel Seven played nicely with their TV screen trademark Live and Free/7, by adding the ze to Free, to make it Freeze; homage to the The Big Freeze events that now mark the Queen’s Birthday long weekend round between Collingwood and Melbourne. Over the course of these three days I watched this game and that of the Tigers on Friday night on the television and from the comfort of the lounge room. Across two games and eight quarters of footy I sat, ate and watched. I enjoyed a lovely splash of a Heathcote Estate Shiraz, an open fire and the company of family and friends. All up, that’s about six hours lounging about, relatively inactive. I say this because I am intrigued by the space that plays between the sporting fan or the spectator, and that of the sporting participant or the player. There exists an interesting play off between the entertainer and the entertained; the player and the spectator. One can participate in a sporting game or contest without spectators, but spectators cannot spectate without the active participants of a given sport. Spectators are dependent upon the activities of others. For the spectator, watching televised sport requires that we minimise, sacrifice or suspend our own physical movement for a considerable period of time, in order to pay attention to the the physical movements of the players, and of course, to absorb the nuances of play. Attending the game itself adds to the physical dimension, and in a heated contest, spectator involvement with significant physical gesturing, cheering and barracking does add to to the physicality of observing. Whilst not entirely passive, I have decided that spectating is an essentially sedentary activity. The insidious thing about MND is the way it creeps upon the individual and robs them, not of their will to do or to act, but of their ability to move….hence the MND foundations tagline ‘Freeze MND’ because, MND freezes the sufferer. Many diseases of the body and mind are harsh; the harshness of Motor Neurone Disease is in the very fact that it renders people immobile at a time in life when it is least expected, often within a very short period of time. Messages from the brain through to the motor neurones of the nervous system fail to transmit signals, rendering muscles of the body inert, or frozen. It’s cause is unknown. And there is no cure, yet. MND robs the individual of his or her capacity to stand, walk, run jump, hold, carry, speak.. even to sit…….to bump, mark, fly, race, leap, shepherd, kick….to work, to physically care for another, to feed oneself, to turn the telly on…or off, as could have been the case on Friday night. In stark contrast to the debilitating effects of MND, and many other physically disabling diseases, Monday’s game at the MCG transpired to showcase brilliant examples of physical strength, athletic prowess, sustained endurance and even beauty, across the four contested quarters. On page 52 of Tuesday’s Herald-Sun, Mason Cox appears in a photograph sailing high above two of his his Melbourne opponents, every fibre of his being is engaged to propel him upward, whilst maintaining a cognitive focus that enables him to be in the right spot at the right time to capture and hold the football. He has the attention of 83,518 people watching him. With his towering 211 cm/110kg frame, every muscle, every nerve and every motor neurone seems to be in peak working condition. Mason Cox, along with his on-field peers, represented all that is, and that can be, taken from you with a disease like MND. I think Monday’s game and the Big Freeze focus reminds us of specific diseases like MND, and of any physical disability that takes from an individual their ability to do, or to act within the world around them. Monday’s game represented a celebration of that which can be done when there is a will to do. As for my six hours of lounging about on the weekend, I’ve decided there must be a healthy balance of both playing and spectating; of doing and not doing….and that in times of not doing, the mind could wander and decide to write. I’ll now peel myself off the couch, remove the Ugg boots and head out for a walk….it too, is Live and Free. Love the image. Is this part of a new digital series? Fantastic to see the Collingwood and Melbourne players with their socks pulled up juxtaposed against the heavily advertised grass, screen and jumpers :) Great clash of old-school footy style with new-fangled advertising regalia. Am i correct in thinking there is a yellow sash for phone’s wallpaper? Nice words, Kate. All so true. Hi Andy, thx for reading… yes it certainly is a tiger striped , remote control, not a phone. And yes, playing around with the many and varied ways of producing work on both the Phone and the iPad. Thanks for your comments Yvette and Smokie. OK there is never any live and free, there is always a catch. Channel 7 used to tape over football matches and destroy film, so a lot of stuff is lost forever. The story of my epic quest to see round 14 1988, Starcevich destroys Carlton, is the source of legend – got a friend to tape it, but his son came into the world that day so tape forgotten. Until recently most matches were not seen. Until 1991 they could not be bought on Name a Game. Before 1974 all the GFs were in black and white. Now you can look up YouTube and most are there, or just go to the pub the following week if you missed it. Now you can see the WAFL and SANFL on catch up. We are spoilt. I’m taken again to Cloudstreet; I’m there. With Sam Pickles and his shifty shadow. And Fish Lamb. And Quick. Who will be touched today? Enjoying very much your fountain of creativity. Great work Kate, it was a very entertaining game and your description of Cox flying for a mark was wonderfully evocative couched against the scourge of Motor Neurone. Hope you enjoyed your walk! Kate – powerful juxtaposition of football played in full flight, and the horrendous effects of MND. I was at the G on Monday in the Olympic Room. It was packed. Neale Daniher came in to address the 500 or so there. His message was never give up, never give in, keep going. Simple and powerful. Joy in the Valley of Tears. Thanks Kate. And the simple image – so homely – adds so much to your timely words. Oh dear! I think i must have a problem, Kate. Nine games over about three days. Lots of inactivity! Jan.. error with those question marks above. I think I need specs. E.ERegnans, thanks for the Winton analogy , I loved that book but it’s been a while. Will re visit. Re fountains of creativity…. I’m always worried it will dry up. Jarrod and Dips, thanks for your observations…. Mason and Co do the hard work; again I’m just an observer. Dips, ND message is so simple but so powerful in its simplicity… Do what you can, now and while you can, is what I take from it. His power has been In sending his message so wide and so far and to be able to do that in the manner he has is incredible. I think his capacity within the footy realm has been that he has made the condition real to us all.. I know others like Stephen Hawkins also put it out there, but with ND, people feel connected and are better placed to receive and take in what he has to say. Great reading Kate, even as I sit sedentary at my computer, trapped by the cat asleep on my lap. (I’ve already done my 6.5km river walk today, thank goodness!) It’s very interesting to think about that juxtaposition between spectating something that is so physical. It’s funny, as I get older, I find it harder and harder to sit through four long quarters at the SCG. (Perhaps) My favourite footy slot used to be Friday nights in Sydney, before we had 7Mate and the Friday night telecast. We used to listen while we washed up, maybe cooked something for the weekend, finished the bottle of French red, tidied, chatted. Parkin and Maclure and Schwab. I always adored the way these commentators had to find words to describe the movement, immediately and for hours. It seemed like the most creative thing. Somehow sitting down to Friday night viewing doesn’t feel anywhere near as engaging or productive as the listening used to … maybe it’s about that level of ‘activity’, the widening of that gap between what I am looking at and my experience of my own body. Which turns my thoughts to what it must be like to feel and know your body failing you against your will. So much respect for Neale Daniher. All week, when things have come up and challenged, I have recalled what he describes as his ‘family motto’. I have muttered to myself ‘Play on’. You are in a golden patch creatively. Play on. George, thanks , you are right about being spoilt for choice now. It’s a shame if channel 7 did tape over some of their material. I have watched some snippets of those much older games, black and white pre 67/ish some brilliant footage and commentary; one of the things that stands out (outside of wins and losses) is the amount of stuff/streamers etc that litters the ground.. as u probably know, I’ve been told it was torn up paper? Phone books? It reminds me of how much change has taken place when u consider how manicured and perfect the ground is now. I take it you are not talking about the Demon Harmes either. Hi Mathilde, thanks for your words… one always feels better with exercise done before heading to the computer… it’s a trap because I can get stuck on it. However, this year I have had a lot more time to paint, and holiday so I have had next to no time on it,, and dread. A bit having to go upstairs to do things that have to be done .. I tend to write on phone or iPad on the run, not desktop. Radio is best medium when not at a game, allows you to do other things. ASydney river walk sounds enticing. I try and convince myself, Kate, that because I’ve always been an exercise addict (cycling everywhere in London when I lived there; cycling from Brissie to Melbourne and back; running around the local oval 10 times each morning for 22 years in Brissie and then cycling up those hills to work and back each day; now walking at least one hour every day), that it’s just fine to be a slob in front of the tele for however many hours you’ve calculated each week! Must admit, when a game is very one-sided I do fast forward sufficiently to still be able to know what’s going on! A little bit of what you like is just fine with me! 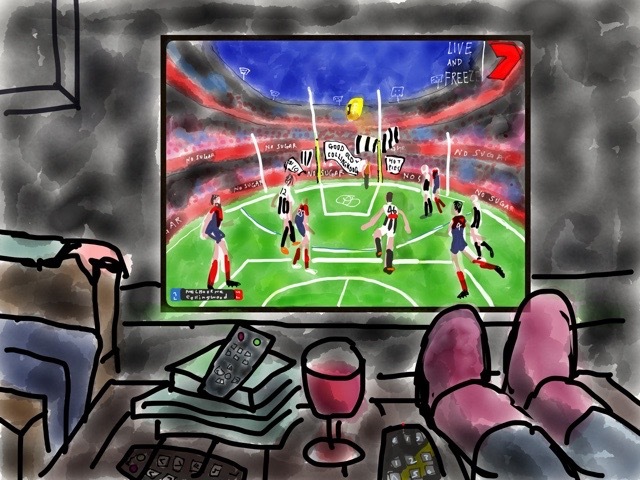 Kate, lovely painting of what was a great day of football! With the footy in full swing, the cricket back on and the soccer World Cup about to start, your reminder to keep active is timely. Super painting and story, Kate. Cox is a feel good story and MND the obverse. Love how the community has rallied round Neale Daniher. He has always been a class act.